you mentioned we could use yeast but you didn’t say how much…how much yeast and appx how much flour are you using. as I am new to bread making any additional information about measurements of ingredients is appreciated. Welcome to bread baking! The quantities Eric mentioned were: between 1/4 teaspoon and 1/2 teaspoon of instant dry yeast (see 1:27 of the video); and 3c of flour - to start with - (see 2:27 of the video), adding more as needed. Hope this helps. Enjoy and cheers! Well, I made Bread #1, the whole grain, using Turkey Red and Spelt, with a little white thrown in and a wee skosh of yeast. Might have let it proof a little too long, but got quite a nice oven spring. It’s great! We might put a little honey in it next time. Now I’m working on that sandwich bread I’ve been looking forward to. My baking pans are 9 x 4, but I don’t know whether that’s considered standard or large. Takes about 6 cups of flour for two loaves. Not measuring this stuff is making me nervous because I couldn’t seem to get the dough to be not so floppy and wet, kept having to add flour. Seems like I must have used 6 cups! Don’t know whether I’m making one loaf or two! Well, finally I said that’s enough stretching, kneading or whatever, and covered it to rise. Which is where it is now. I know it will taste good no matter what it looks like. Omigosh! This is the answer to a maiden’s prayer! I have been looking for years to have a whole grain sourdough sandwich bread—now thanks to you I have it! I forgot you used milk, and don’t think I had a whole 50% white (wasn’t measuring, you know), but the result is still splendid. It’s got heft, flavor, and you can cut it pretty thin. Aaaaaah! Toasts beautifully too. Thank you so much! Awesome. So glad to hear it ! I am very frustrated with the Easy Bake Videos lack of measurement for ingredients. There may be a lot of bakers who like to “wing it”, but I am not one of them. All the bread recipes, that I use, including many excellent ones from Breadtopia, call for ingredients by weight or, for small amounts, measures. The sandwich bread looks great, but I wouldn’t even attempt to make it because the recipe is so inexact. Please, oh please, could you give measurements for those of us who just aren’t willing to deal with trial and error. I think the whole point of the easy bake series is to develop enough intuitive feeling for the dough that relaxing the need to follow specific weights, measures, and timings leads to the ability to get good results consistently. In other words, exactly not trial and error. I’m only just beginning on my journey as a bread baker, but the primary thing I have learned so far is that good baking, unlike many other forms of cooking, has a high degree of art rather than science because there are so many variables involved that interact with each other in unpredictable ways. Some of them are relatively visible (like the ambient temperature), and some are nearly invisible (like the activity and makeup of your sourdough starter). And that doesn’t even take into account the grain/flour related variations in origin, freshness, etc. Without being able to control for a lot of things that you can’t come close to controlling as a home artisan baker, the end result loaf of bread is absolutely not predictable by following a standardized procedure with specific weights and measures and timings. But, if instead of following instructions by rote, you pay attention to the look, feel, and smell of the dough as you are working with it, then you can start to get a feel for how those qualities translate into a particular loaf of bread. That way, you become able to adapt in how you combine the ingredients (including how much you use) in a sensitive way that will lead to good results when your house is 65 degrees and also when it is 85 degrees, or when your starter is especially active, or not so active, or when you happen to get a batch of flour that performs differently from the previous batch of what was supposed to be exactly the same flour, or when your timing works out that you need a loaf later today vs. needing it tomorrow evening. It’s definitely very useful to have a starting point with specific weights and measures and timing - especially when first starting out. But once you have baked a few loaves by following a specific recipe (which as you say there are many of available on this website), then I think the real art starts by developing the sensitivity to the dough that allows you to know what’s right and what needs correcting and I think that’s what Eric is trying to help us develop in his easy bake articles. First time bread baker. Tried to follow recipe, but when done, the bread tasted ‘uncooked’, altho i had removed it from the oven when it reached 200 degrees. Also, I used your sourdough starter (for the first time) and just put in what i thought was the right amount, but there isn’t any sourdough flavor. My oven temp has been checked by an oven thermometer so it should be exact. The color was good on the crust. I’m worried I used too much flour, and it’s hard to tell because there aren’t any measurements. I understand that I need to get a feel for it, but maybe if you could just say in the video, “I’m adding another CUP, or I’m adding another ½ cup”, or something like that. Any thoughts about why there is no sourdough flavor? I got the sourdough live starter about a week and a half ago, and was diligent about adding flour and water. and each time I did, I did see the reaction in the jar. The bread rose well, and had a nice oven rise. The color was good. The crumb was awful. Thick, heavy, dense, tough. In my experience so far, all other things equal, the longer I let the dough “bulk ferment” (aka “first rise”), the more sour flavor develops. But in order for it not to over-proof that means keeping it at a relatively cooler temperature, so for me that means either the basement overnight, or in the fridge for maybe a couple days. I keep two different starters (both started from the same batch of @eric’s live starter); one is only fed white flour and the other is fed 50/50 white flour and whole wheat flour (either spelt or red fife or turkey red, depending on what I have on hand). …And I have also noticed that the starter with 1/2 whole wheat flour has a much more sourdough smell to it where the all white flour starter smells much more sweet. My naive diagnosis of your report sounds like either your starter may not be active enough, or your bulk ferment may not have been long enough. If just starting out, it might be worth trying to start with the more specific technique and measurements in this post: Sourdough No Knead Bread. This is the second time I have made your sourdough sandwich bread. 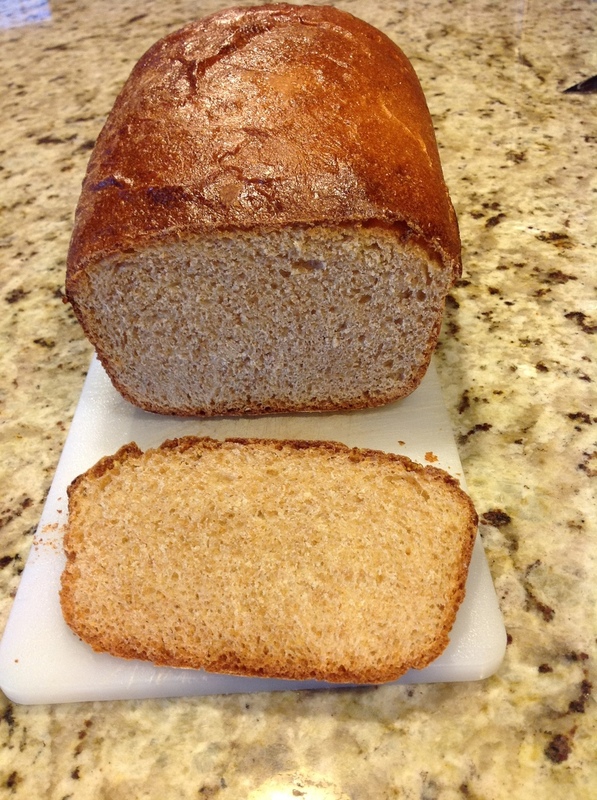 It turns out well, that is it rises nicely when given enough time and has a tender and smooth crumb perfect for sandwiches and toast. However, I find, whenever I make a sourdough whole wheat bread, that I really don’t like the combination of the sour and sweet wheat flavors that is in the bread. In all my experience with sourdough I have found that the “sour” flavor develops over time. That means that if I use less starter and let the dough proof for a longer time it develops noticeable sour flavor. But when I use more starter and shorten the proof time I get much less sour flavor. And that is what happens naturally when I make a crusty, white flour bread. It rises so well and so fast that I get perfect results without fussing over how much starter I put in it. That said, this sandwich bread, with its drier dough, prepared in my house, with my starter takes a very long time to rise even a little using about 1/3 cup starter. This last loaf took 18 hours to get not quite to double in size. And then it took about 2 1/4 hours to rise in the basket before baking. All that fermenting time developed quite a sour taste which, as I said isn’t my favorite flavor. I really like a rustic, wheaty, grainy flavor in my sandwich bread. So I might just have to go back to using a conventional yeast recipe from now on for my whole grain sandwich bread. As you can see the bread looks really good thanks to Eric’s wonderful lesson. Hmmm, maybe not. How do I include a photo here? “just drag and drop” Drag from where? I have the photo in my computer and I know how to drag and drop between my own files but how do I get them from there to this web page? I am unfamiliar with the way this page works.I will try the upload button. DONE! thanks. I made this bread yesterday for the first time without any seeds. Watched the video and turned out very good. I used half wheat and half white flour, used only 1 1/2 cups of liquid instead 2 cups, almost 2 tablespoons of my sourdough starter. I also added a small amount from Eric’s barley syrup. The dough takes a long time to rise, almost 11 hours in my house. The next time I start at night and let the dough proof during the night. Thank you Eric for the lesson. ell, here’s a followup to my post of Sep. '15. Though I am now a mere lass of 86 years, I developed arthritis in my hands, fingers, wrists, so haven’t concentrated on many activities I used to do—like baking bread. However, I have improved somewhat recently, no longer quite the cripple that I was, and put my bread hat back on. Seems to have rusted a little! I did make a loaf, just have let it rise too long the first time, and second time, in the pan, at 2 hours it was only to the halfway height of the pan. Baked it anyway, and it is a short loaf, didn’t get much oven spring— but what a flavor! Little dense, but not a solid brick or anvil, I’d say more of a porous brick. Anxious to get busy making another one, watching the timing much more closely, and observing the look and feel of the dough (yes, I went back and read the directions!) Thanks again for this video, Eric.